Leon Junction, Texas. AKA “The Junction”. Established in the 1880s, the name, of course, comes from the river. The junction was added when it was announced that a railroad would be coming through. But that particular railroad never materialized (or took a more lucrative route). The people didn’t have to wait too long. In 1882, the Texas and St. Louis Railroad completed a line from Waco to Gatesville and Leon Junction was on the route. The following year (1883) a post office was granted. Growth was slow and in the mid 1890s, the community still only had 50 residents. Cotton farming was the principal livelihood and residents had a choice of three general stores to trade or barter with. Being close to the county seat with a railroad connection made growth and self-sufficiency a dream. The population had doubled by 1914. The New Olive School with its two teachers, provided a basic education for area children. The community was hit hard by the Great Depression and the population dropped to only 25. In 1972 the railroad quit running and only a single business and the post office remained in the 1980s. The figure of 25 remained in use for the 1990 and 2000 census. 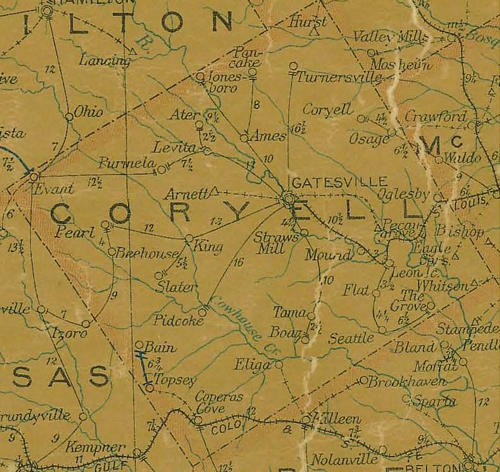 Coryell County 1907 postal map showing Leon Jc.